This week's blog is a gueat blog, written by my friend Daniel from Germany, and sort of can be read as a sequel to the Blog of February 20th. A travel to Daugava River. The chronicles of Latviešu Indriķis. Henry of Latvia, or Latviešu Indriķis in Latvian language, was a German priest, historian and missionary who lived from the late 12th to the early 13th century and went to Latvia in 1205. There he witnessed the religious battles between the Teutonic Order and the Latvian tribes, who were not willing to give up their pagan rites and their land for the imposed Christendom. Between 1225 and 1227 Henry wrote the Chronicon Livoniae, where those battles are described. Within the chronicles, the historian mentions a war council of the Livonians, held in 1206 upon a hill nearby the city of Ogre. Fig. 1: Territorial division of Livonia in 1260, highlighting today towns of Ogre and Ikšķile. In the early 13th century, numerous battles between local tribes and the western invaders were fought in the region of Daugava river. The remains of one of those battles were found in Ikšķile, nearby Ogre, were the Livonian war council took place according to Henry of Latvia. 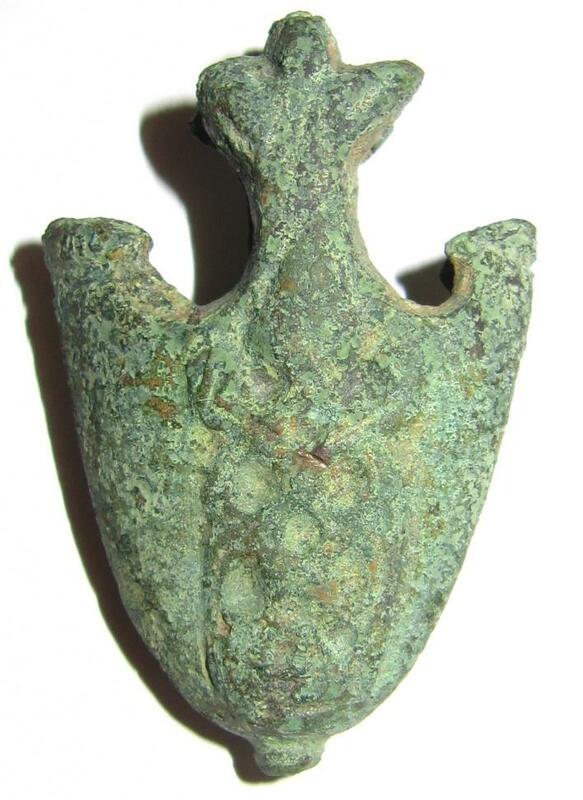 One of the items found there is the chape of a sword scabbard. The closed cast-bronze artefact measures 5.8 x 3.75 cm, a comparably small dimension. It has a tip on the bottom and ornaments on both sides. The lateral spurs show line ornaments and hardly visible traces of silvering. The central spur of each side ends in a triangular palmette, with a little hole in the center of only one side. This is interesting, as the Scandinavian counterparts are supposed to be fixed at the scabbard without nails or rivets. However, few Baltic finds show similar means to attach the chape to the scabbard tip. Maybe the owner added this hole after the chape fell of the scabbard. The main ornaments show a triangular end, with a net of holes and lines below, ending in the bottom tip. Fig. 2: Cast-bronze sword scabbard chape with palmette and Baltic-Varangian ornamentation (after Paulsen). The chape shown in Fig. 2 is remarkably rare, especially in this undamaged condition, and references are accordingly scarce. 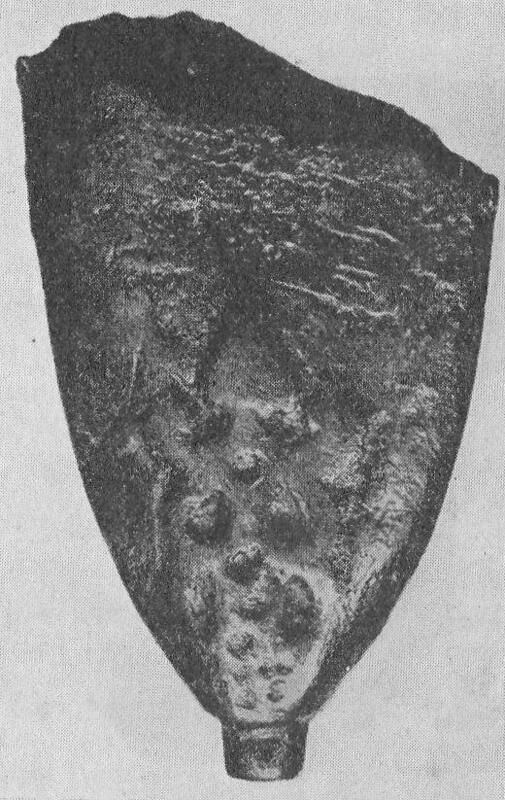 However, a damaged chape with exactly the same main ornament is known from Kiauten, East Prussia. It is shown in a book of Peter Paulsen . Fig. 3: Left side - Ornament detail of sword scabbard chape of Baltic-Varangian group (no. 86), found in Kiauten, Kr. Samland, East Prussia (Photo from Prussia-Mus., Königsberg, former East Prussia). Right side - examples for different expressions of chapes beloning to the Varangian-Baltic group: 80 - Bauske, Curonia, Latvia; 81 - Treyden, Livonia, Latvia; 82 - Alt-Rahden, Kr. Bauske, Curonia, Latvia; 83 - Kapenieki, Kr. Goldingen, Curonia, Latvia; 84, 85 - Katzdangen, Curonia, Latvia. (Taken from Paulsen, 1953). Unfortunately this reference shows only the detailed photo of a chape with the upper part missing and one has to guess if it once had the same type of palmette as the one of Fig. 2. Presumably this is not the case, as there is a large area above the ornamentation left. 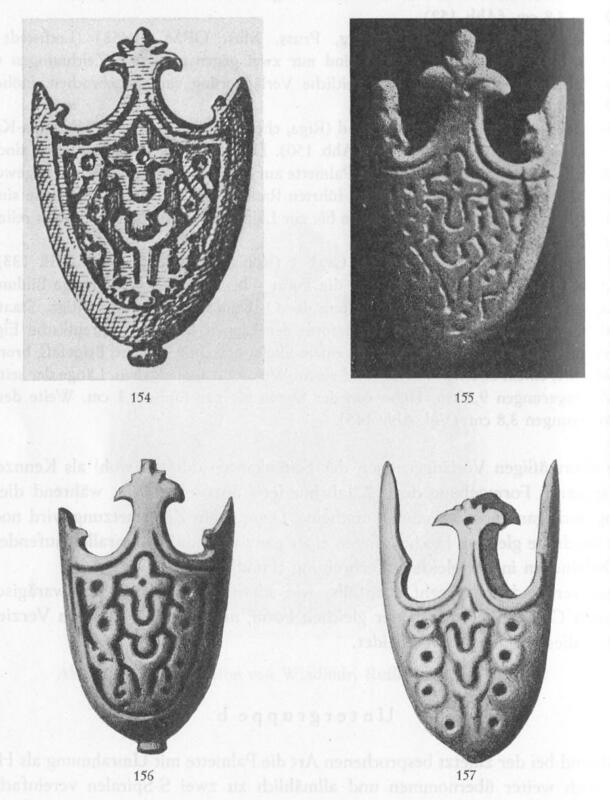 Although it was found in East Prussia, Paulsen classifies the chape ornamentation (Fig. 3, left) to the Varangian-Baltic group (see the blog entry from February 26th for more information). Chapes of this group are either of elongated or compact form. The chape discussed here belongs to a more compact type, represented best by picture no. 84 (Fig. 3, right side). But, with special regard to the spurs, it is also similar to chapes from the Baltic-East Prussian group. Especially chape no. 155 shows similarities to the introduced object (Fig. 4). But unlike chape No. 84, it shows the same rugged ornamentation like the broken, originally elongated chape no. 86 (Fig. 3, left side). Does the addressed chape shown in Fig. 2 represents a kind of "missing link"? If Paulsen has had this object for the studies that led to his book, would he have re-classified the chape no. 86 as Prussian instead of Baltic-Varangian, in accordance with the fact that it was excavated in East Prussia? Or is it indeed a chape that can be classified as truly Baltic-Varangian? Anyhow it is, as well as the chapes no. 80-85, excavated in Latvia, and combines two characteristics that belong to this group, probably just not shown in a single object before. The circumstance that the Baltic region had a dense net of tradeways during the late Viking period complicates a local classification of such objects. 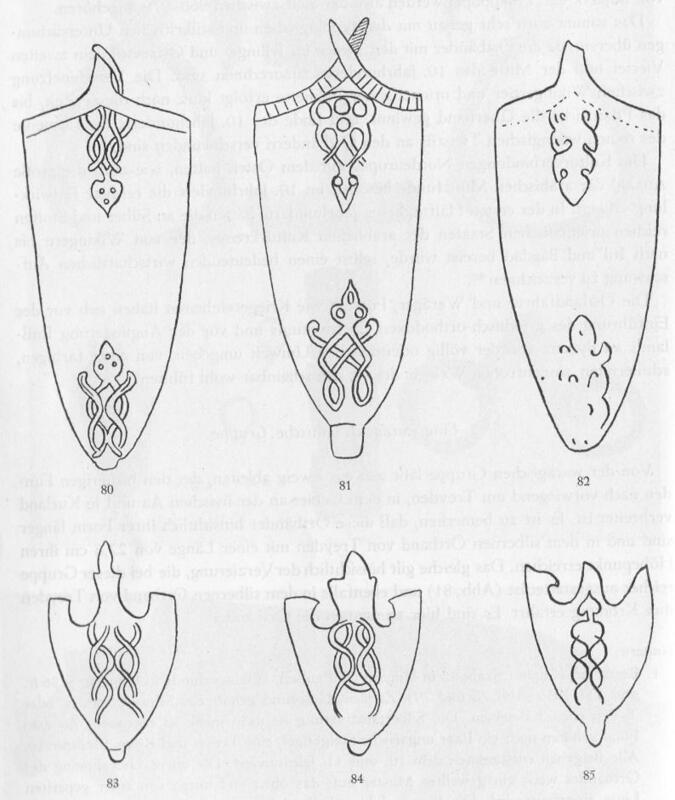 Wherever the chape of Ikšķile was crafted, the hybrid of the mysterious ornamentation and outer shape variations of sword scabbard chapes belonging to either the Baltic-Varangian group or a Curonian-East Prussian subgroup seems to be of scientific value. As some similar chapes were excavated in the province of Livonia, it seems also possible that this special style is a local Livonian expression influenced by the surrounding areas. 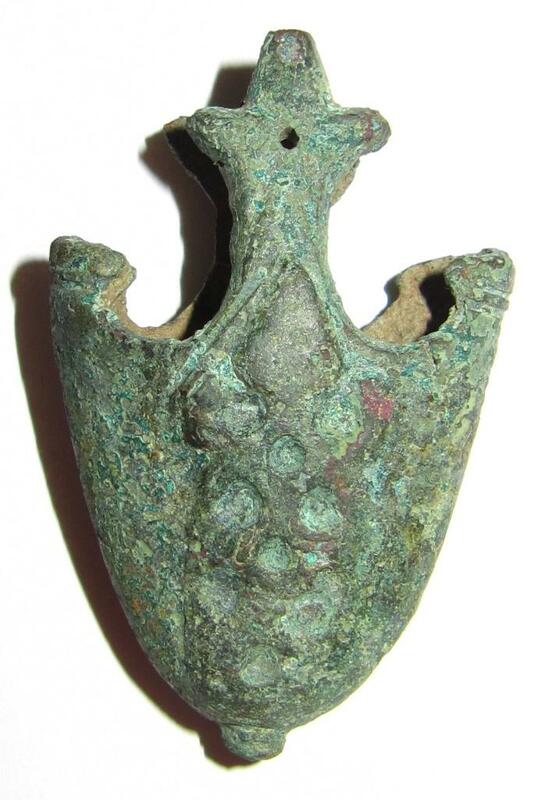 This would match the excavation site of the discussed object, Ikšķile, which belonged to the territory of the Livonian Order in the according time around the 12th and 13th century (Fig. 1). Although no other available literature but Paulsen's book describes a similar piece, it cannot be excluded that analogous artefacts were excavated. However, it could be truly unique. Peter Paulsen, 1953: Schwertortbänder der Wikingerzeit. The Map image was taken from Wikipedia and edited, the copyright for Fig. 2 is entitled to the author of the current article, whom I gratefully thanks. due to busy other activities, enabling me to write a blog of my own this week. Next week ? Maybe another intruiging guest-blog, maybe one of my hand..
Thomas Kamphuis, March 10th 2015.